Israeli jets are being allowed to attack targets inside Syria despite Russia’s “anti-aircraft umbrella,” an Israeli analyst said. Most recently, the Israel Air Force attacked a Syrian target in Kuneitra after mortar fire “leaked out” from the Syrian civil war to Israel’s Golan Heights. Lerner added that he “doubts” Israel would have had a similar understanding with the U.S. if it was an American anti-aircraft umbrella. Iran, which is one of Syrian President Bashar Assad’s top allies, criticized Russia for allowing Israel to strike inside Syria. “The anti-aircraft systems that Russia has brought to Syria shouldn’t allow even one single [enemy] aircraft to fly over the country – but this is not happening,” said Islamic Revolution Guards Corps (IRGC) Brig. Gen. Khosro Orouj. Meanwhile, Syria continues to pay a heavy price in the 50-month-old civil war. This week, 38 soldiers were killed in a tunnel blast, eight people were killed by mortar fire in Damascus, and 19 civilians were killed in fighting in Haleb. 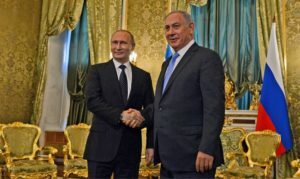 It was also reported today that Assad made a secret visit to Russia prior to Netanyahu’s visit, and discussed with Putin a plan by which Israel would withdraw from the Golan Heights.